A couple of years ago if you had of asked me whether I would have liked to have gone on a night cycle ride, the answer might have been why? Since owning a Brompton and suggesting a Christmas night ride I have not looked back. There is something rather alluring about a night ride. Add to this the London skyline at night and you are on to a winning combination. Rain had been accurately predicted for this ride and despite this eight of us in total braved the elements to meet near the London Eye by 19:30. 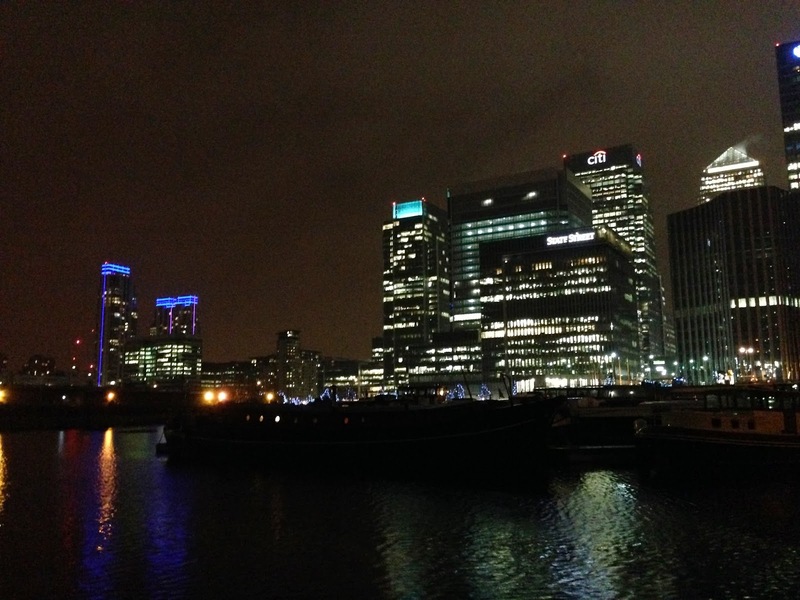 Our leader for the ride was David and yet again he had come up with an interesting concept - Docklands by Dark. After waiting a suitable time for any late comers and viewing sick notes from Matron we headed off, lights ablaze and full waterproofs on. 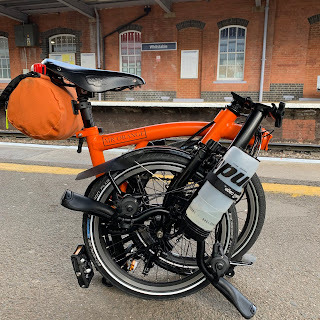 I decided to take my Original Orange Brompton and had packed my big camera just in case the rain relented. Unfortunately, the rain was constant and my camera remained tucked up safely in my Carridice Super C saddle bag. The rain did nothing to dampen any attendees spirits. Many of us are now so used to rain that it doesn't really enter our thoughts. We simply wear or carry appropriate clothing and carry on. It is a great attitude to have and as such results in rides carrying on regardless of weather. One incentive for this ride was that at around the 11 mile point we would visit a fish and chip shop and partake in a hot late night feast. I have to confess to being rather excited at this and it served as a good carrot. The docklands fell into sight quite quickly and although my big camera didn't see the stars my trusty iPhone 5 was able to capture a few grainy photos taken while raining. At Canary Wharf we took a few wrong turns and went round an interesting roundabout a few times. Interesting, as in its centre it had the mother of all traffic lights made up of dozens of them. On seeing it first time, I wondered how on earth I was going to know when the lights turned green. It then dawned on my that it was a decoration. The route as you can see from the Garmin data below was a good one. Lots of twists and turns and interesting views. 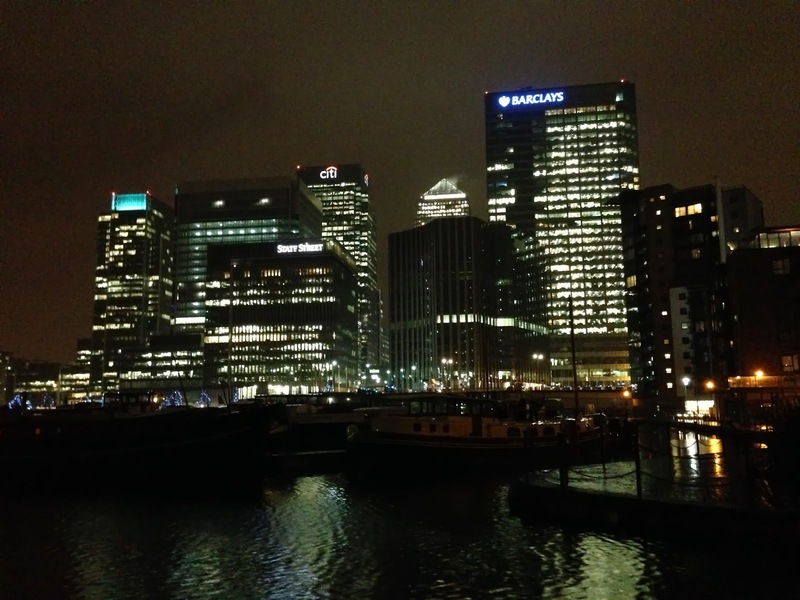 When cycling through Canary Wharf I again was struck that I would like to photograph some of the many buildings. Mental note to self to return there in better weather to do just that. 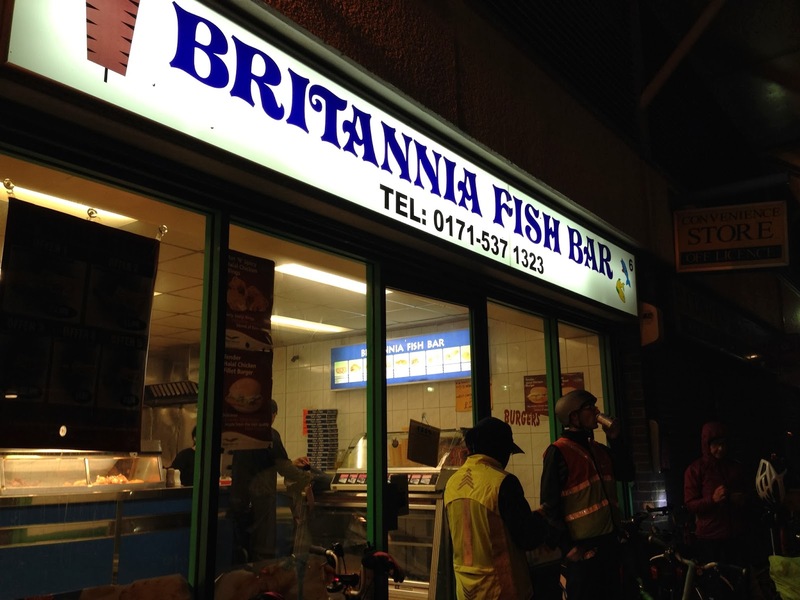 Just after 10 miles or so we reached the 'Britannia Fish Bar' in Poplar. With orders placed (fish and chips naturally) we waited for it to be prepared fresh there and then. Once it arrived I consumed it with enthusiasm as it was pretty good. Making our way to Greenwich we reached the familiar entrance to the foot tunnel under the river Thames. Since our last visit the barriers at various points (presumedly to stop people cycling) had been removed. It made the tunnel much better cosmetically as the barriers were rather unsightly. Once out in the open again the Cutty Sark greeted us in semi darkness. It was not long after this we said goodbye to Mark (King of the Hill) and Tony. It was good to see Mark again and hopefully our partnership on some of the longer rides will continue from last year. We decided that we would take the direct route back to London and near Fenchurch Street we said goodbye to Guy and Jenny. With David, Anne and I pressing on I said goodbye too and headed for Regent Street. Perhaps due to the weather, London seemed quiet. If it hadn't of been raining I would have been able to take some lovely photos as the streets appeared empty. Pressing on I reach where I had parked my car. In all I cycled just over 30 miles if you include my journey to and from the ride. My take is that with so many long distance rides planned for this year I need to take every opportunity to venture out on longer rides. 30 miles is not that long now however I want to not only complete these planned rides comfortably but at a decent pace. Social rides are great and I am going on one soon but I am not going to achieve my goal of improving my fitness further by constantly going on what I call piddly rides. David yet again was a great guide and produced anther very interesting route that I am sure will be repeated. Many thank to him and all the great company. Hello Mr Orange, a rather very nice write up, your Iphone five takes some rather good pictures. During the mid to late 80s I used to bunk off school to hang around Canary Wharf long before all those buildings went up. I to enjoy social rides, but fitness can only be increased on longer rides, nevertheless I await to go on some of those rides you mentioned. In the meantime have a great week again marvelous write up.